Looking online at the spring and summer offerings from the likes of The Gap, Banana Republic, Zara, H&M, etc., I’ve noticed that just about every store has something inspired by India. Embroidered or sequinned tops, cotton kurtas, long, full skirts, and paisley prints, appear to be – from this vantage point – all the rage in the U.S. and Europe, so much so that these designs have trickled down to the mass market. I don’t know if I like this, as this whole India fashion explosion was supposed to happen next year, when I return with an enviable stash of fashion forward Indo-garb. Okay, so I won’t be so special. But I will have a nice array of custom-designed, custom-fit clothing. Over the past two weekends, I have discovered the extremely addictive world of fabric shopping in Mumbai’s Mangaldas Market. 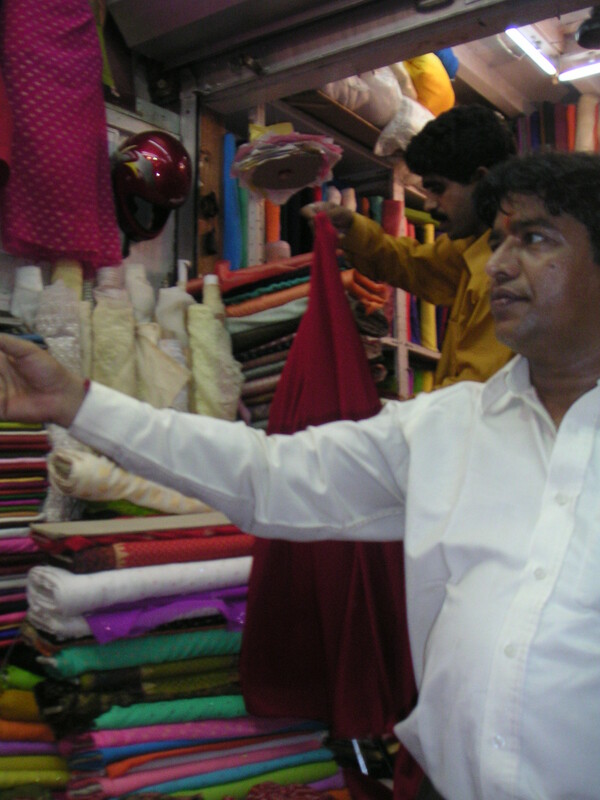 Walk past the chaos of placemat and plastic sellers opposite and slightly caddy-corner from Crawford Market and therein lies the covered bazaar where many Bombay tailors and designers buy their silks, chiffons, and printed cottons. This being India, the vendors are crammed side-by-side along bustling lanes – not aisles, because that connotes wide, empty paths – but numbered lanes, which are as narrow and congested as Churchgate rail cars at rush hour. According to a recent issue of Wallpaper Magazine, John Galliano has been spotted in past years strolling through Mangaldas Market, snatching up bolts of fabric for his ready-to-wear collections. Keeping his motto of the month in mind, I decided it was time for me to jump into the designer game, if only for myself. Bombay makes it easy for anyone to be a designer. Unique fabrics and accoutrements are plentiful. The arduous crafts of embroidery and beading are widely known. And, of course, tailoring is as expensive as you want it to be. It’s a given that if you go to a storefront tailor, he (usually he) will likely outsource the labor to an even cheaper tailor in the suburbs, who may then shop out different components of the work to people below him. So, like in all good business deals, the key is to cut out the middle man. funny we have been doing the same thing lately!! my friend and i have been shopping like mad at all the fabric stores in bandra. we have 3 different tailors here that we love. they are wonderful with western stuff and indo-western wear. we have done the same, printed photos from online and gotten stuff made. last year i was in love with mangalas market, but now its too far and too arduous in this heat!